Topic: RSO to the rescue! If the gus were unloaded then why ban em. Sub 2k looks nice, plus I hear it can run TP9 mags. Also thinking ahout a 9mm AR. Im thinking a G2c g2s or 709 for a car gun. TP9SF, SF Elite or a TP40 for the house. Wonder if that magwell can be changed. Id rather have a TF magwell. It appears to at least be removal on this pre-production photo from Shot Show. Well looks like the TF magwell is a no go there. Id probably use WBB 124gr NATO mostly fro range work. Topic: COMBAT ELITE IS LISTED! Re: COMBAT ELITE IS LISTED! Toss in a red dot and Ill consider it. I like how the TP9 will use aftermarket parts from other guns. 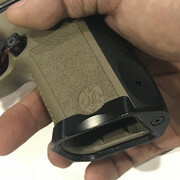 Has anyone tried the Omnivore with the TP9SFX. Im thinking a TLR2 setup, but Im not sure if the barrel is too long or not. Do you carry it or is it home defense/range toy. I am so sold on that light now. Well the $850 MSRP is a deal breaker for me. No RMR included and a threaded barrel without supressor sights in a no go. Ill be staying with the Elite and SFX with Vortex Venom as my Canik purchases. Just a matter of which one to get first. My wife is getting an Elite unless she changes her mind. Topic: New guy from Iowa. Re: New guy from Iowa. Topic: How is Canik not known? Re: How is Canik not known? Bass Pro here doesnt have em. My issue with the counter at my Bass Pro is they are all Glock fan boys. I watched this fuy try to sell a lady a Glock 30 when she clearly wanted to buy an XD.